Aaron Lander of Marin Sun Farms used to be a vegetarian. Over the past few years, the popularity of eating sustainably grown meat has grown dramatically in progressive communities like the East Bay. Marin Sun Farms and The Local Butcher Shop, which sell meat from grass-fed animals that were raised on Northern California pastureland, have opened outlets in Oakland and Berkeley. Numerous East Bay restaurants feature locally-grown, pasture-raised meat as well. Moreover, because of sustainable, humane farming practices, in which animals spend much of their lives outdoors, grazing on their natural food sources, more and more people are feeling more comfortable about eating meat — even those who had once been vegetarian. 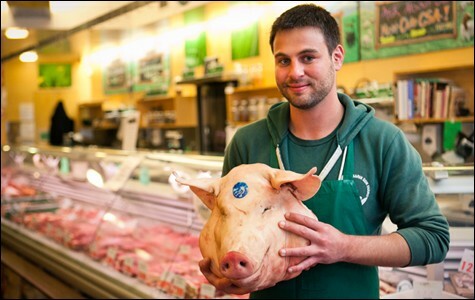 Aaron Lander, a sales manager at Marin Sun Farms butcher shop in Rockridge, is one such person. "I was a vegetarian for six or seven years," he said. "I grew up in Iowa; all the cows there are pumped full of hormones. ... So when I was in college, I decided there was no way I was going to eat meat: 'I'm going to become a vegetarian.'" But then Lander learned of locally-grown, pasture-raised meat, in which cows, pigs, and chickens weren't trapped in factory farms, and instead live their lives outdoors, eating their natural diet of grass and other wild foods. As a result, they weren't getting sick from eating corn and grain, nor were they being pumped full of hormones and antibiotics. 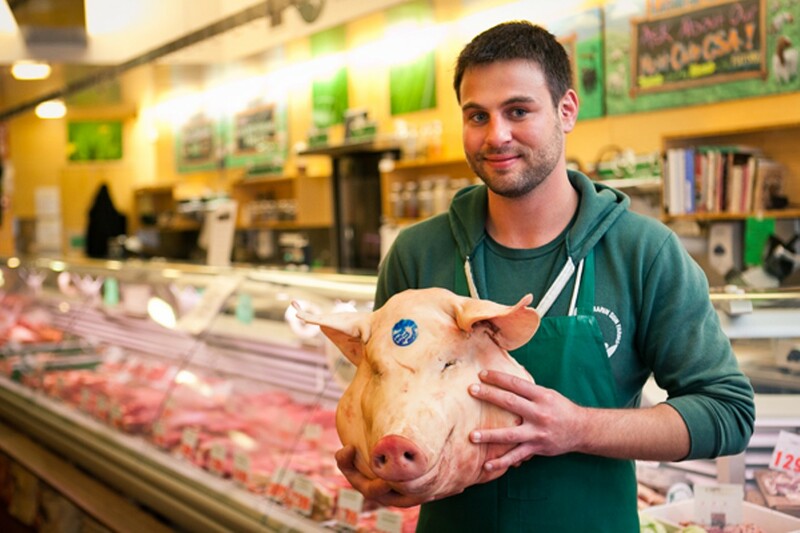 "Now, I'm a carnivore," he said, "but only for [meat from] Marin Sun Farms." Lander is not alone. He said he hears comments at least once a day at the butcher shop from former vegetarians who say they now eat meat — but only if it's pasture-raised. Grace Koss of Alamo, who was chatting with Lander about pasture-raised meat when I visited the shop recently, blurted out — without prompting — that she, too, was once a vegetarian. Koss said she also had stopped eating meat because of the cruel factory-farming practices common throughout the nation. But she added that as someone with a high metabolism, she felt unsatisfied with her vegetarian diet. "I used to have to eat a lot of salad, vegetables, and grains in order to feel full," she explained. But once she began eating high-protein, pasture-raised meat, she said she found that she no longer needed to eat as much food. Pasture-raised meat also has much less fat than factory-farmed meat, especially fats that are unhealthy for humans. "I lost weight ... about seven pounds," she said after she switched from being a vegetarian to eating pasture-raised meat. "I just don't need to eat as much now." The abject cruelty of factory farms is well-documented: animals, packed together, spending much of their lives standing in their own feces, pumped full of antibiotics to ward off infections. In many ways, however, pasture-raised, grass-fed meat is fulfilling the hope that many people once had for organic and free-range meat. Environmentalists and sustainable-food advocates used to view organic and free-range as the antidote to factory farms. But the organic and free-range labels were co-opted and corrupted by Big Business. Lax government standards, for example, allow so-called organic cows to be housed in factory-farm-like conditions, packed shoulder-to-shoulder in tight living quarters. Their feed is typically made of organic corn and grain, and though it isn't laced with pesticides, it still makes cows sick, because their stomachs don't have the ability to digest it. Cows are grass-eaters, so corn and grain raise acidity levels in their bodies, making them more susceptible to illness, including E. coli and other bacterial infections. They also are more likely to suffer from dehydration, intestinal damage, and liver problems. Likewise, free-range chickens aren't actually free-range. Most, in fact, never actually go outside. Under weak government regulations won by large agribusiness, the free-range designation only requires that the chickens have "access" to the outdoors. For Rocky Jr. chickens from Petaluma Farms, that access is a semi-enclosed sun-porch that the chickens tend to avoid, according to research from the Cornucopia Institute, an environmental watchdog and scientific research group. But pasture-raised, grass-fed cows, pigs, and chickens really do spend most of their days outdoors on open pastureland. Indeed, "pastured" and "grass-fed" have effectively replaced organic and free-range as the standards in sustainably grown, cruelty-free farming. Living on pasture and eating grass not only make the animals healthier, but a growing body of research shows that the meat they produce is much healthier for humans. A report from the Union of Concerned Scientists, written by a UC Berkeley researcher, concluded that beef from pastured, grass-fed cattle contains lower total fat than factory-farmed meat. It also has higher levels of omega-3 fatty acids and Conjugated Linoleic Acid (CLA). Scientific studies have shown that omega-3 fatty acids lower the risk of heart attacks, lower blood pressure, and improve vital brain functioning, while CLAs may lessen the chance of getting cancer. Milk from pastured cows also has higher levels of CLAs. In addition, according to research from the University of Wisconsin, Madison, pasture-raised, grass-fed beef contains less than one-quarter of the saturated fat that factory-farm beef does, and contains a little more than half the calories. In truth, pasture-raised beef is more akin to skinless, boneless chicken breasts than factory-farmed beef. A three-ounce beef loin from pastured steak contains 2.5 grams of fat and 129 calories, while the same amount of skinless, boneless chicken breast has 1.3 grams of fat and 119 calories. But pastured chicken is even better for you than that. It has up to 20 percent less total fat, less saturated fat, and 28 percent fewer calories than factory-farmed chickens. Eggs from pastured chickens also have 10 percent less fat, 40 percent more vitamin A, and 400 percent more omega-3s, according to research from Iowa State University. It's no wonder that the popularity of pastured meat is exploding in traditional vegetarian strongholds like the East Bay. Representatives from Marin Sun Farms and The Local Butcher Shop say their businesses are booming. "People are really excited about this," said John Hogeland of The Local Butcher Shop, which opened last year on Shattuck Avenue in North Berkeley. "The interest has been pretty intense." The Local Butcher Shop sources from small sustainably run farms that pasture their animals within a 150-mile radius of Berkeley. Marin Sun Farms, meanwhile, gets its meat from a cooperative of pasture farms in the North Bay. But unlike other butchers, The Local Butcher Shop sells sections of pasture-raised cattle, rather than specific cuts of beef, such as rib-eye steak. Hogeland said he was surprised at how customers have been willing to try non-traditional portions of the cow — as long as it has been raised on pasture. "I thought we'd be up to our waists in beef shanks, but customers have been willing to try it; it's a great cut, and now we have a regular clientele for beef shank," he said. "It's pretty gratifying to see that people are excited about what we're selling." Organic Valley, a trailblazer for small, sustainable farms, has an exclusive deal with a California factory-farm egg producer that doesn't let its chickens roam freely outdoors.